Our mission is to provide you with beautiful, natural-looking results, for improved self-confidence for a lifetime. We offer experienced, board-certified care with compassion and safety. Let us show you how easy it is to create a more beautiful you. Dr. Debra Stafford is the third child out of four of Dr. Novarro C. Stafford and Mrs. Louise B. Stafford. Debra’s parents have always taught their children the value of hard work and dedication to the pursuit of excellence. The Stafford children took those teachings to heart and all four have become physicians. The eldest, Chuck, is a pediatrician practicing in Houston Texas, Rick, is a general and trauma surgeon and critical care specialist in Southern California, and the youngest Vivi, is a general practitioner who concentrates in cosmetic dermatology and substance abuse and addiction in addition to general practice located in Fresno and Los Angeles, CA with a master’s degree in Public Health Administration. Debbie’s father is an anesthesiologist who recently retired from his profession at the age of eighty-three who entered college at the age of fifteen and became one of the youngest commissioned lieutenants in the US military. Dr. Novarro Stafford was also a military deep sea diver and licensed military plane and helicopter pilot who once repaired his plane after making an emergency landing in a field in Germany with a safety pin. Dr. Stafford also applied to the NASA space program and after being turned down, entered medical school. Mrs. Louise Stafford is a retired school teacher whose innovative reading techniques have taught hundreds of children to become proficient readers at an early age including her own children. She is now instructing her grandchildren and instilling in them the wonderful love of reading. Mrs. Stafford (Louise) was also accepted into a Ph.D. program in a Germany University but turned down the offer because she decided that as a mother, she needed to be available to her young family. Dr. Debra Stafford has been practicing medicine since she was 24 years old. She began her medical career younger than most because she was driven to become a physician at the tender age of six or seven years old. The idea did not come as a vague notion over time, it was a sudden decision. The young Debbie was sitting at the dinner table with her school teacher mother and anesthesiologist father and her other siblings when Debbie made a big announcement to her family. She was going to become a school teacher like Mom when she grew up. Dad looked up from his dinner and said “Debbie, I think you should become a doctor like Daddy” Debbie was a little stunned, but after a few minutes of thought, she decided that the idea of becoming a doctor like Dad sounded like a good idea. A doctor was born at that moment. We all have seen young children full of fantasy and wonder stating that they are going to become a chef one year and then change to an astronaut the following year to a fashion designer the next to a fireman or police officer the year after that. Incredulously, Debbie stuck to the idea of becoming a doctor over the years. Although Debbie knew that she was a strong reader, she realized that she would have to bring home top grades to her parents if she were to get into medical school. When Debbie’s fourth grade teacher placed Debbie into a reading level that Debbie thought was not sufficiently advanced for her, she personally complained to the teacher. Debbie was not only disappointed but angry when the teacher refused to reconsider her position. From that point on, Debbie vowed to work even harder. When the family moved from the east coast to California, Debbie was nine years old and entering the fifth grade. She saw the move as a brand new start and was determined to excel in school. She loved her new school and for the first time earned strait A’s. Debbie’s academic success in the fifth grade, gave her the confidence that she needed to excel and earn top marks. In addition to studying hard to reach her dream of becoming a physician, Debbie was pursuing multiple hobbies. Dr. and Mrs. Stafford were strong believers in well rounded children and exposed their children to many activities. Debbie realized that she was a fast runner being able to beat all of the boys in her class except one in the 50 yard dash in the sixth grade. She continued track and field throughout high school competing in the long jump, 100, 220, 440 and 880 yard races. She earned a varsity letter and won multiple medals in track and field at her prep school as a teenager and was voted most athletic by her senior class. Debbie considered running at her college Brown University but decided against it when she realized that she was not fast enough for the college level. Debbie was also a student of classical piano from the age of four years and also studied violin for a short time in the second grade. Debbie continued studying piano throughout college and is an accomplished classical pianist and currently continues to play and perform in small recitals. She is also an intermediate in the violin having taken up the interest again in the instrument as an adult after many years of not playing. The Stafford children were also exposed to downhill skiing and Debbie showed promise in this sport as well. She was invited by a local Vail ski instructor to train at an east coast boarding ski school. Her parents were not for that idea although Debbie really wanted to do it. She continues to ski despite having suffered an ACL injury the year before beginning her surgical internship and is an expert skier able to tackle double black diamond runs. The Stafford children were all also involved in martial arts. Dr. and Mrs. Stafford strongly believed that martial arts training provided excellent focus and discipline to children. They also felt that if the siblings wanted to beat each other up then what better place then an organized martial arts academy. Seriously though, the parents understood that martial arts taught children confidence and self esteem and lessened the need to show off or dominate other kids. The study of martial arts has helped the four Stafford children develop a calm and steady personality not quick to anger. Debbie is currently a second degree black belt in Taekwondo but has decided to stay in shape currently with yoga. Martial arts will always be apart of her life in that she introduced her husband to Taekwondo and he has earned his black belt and their children have been studying the discipline since the age of three years. C to a B. The algebra experience was a valuable one for Debbie because she learned that often a challenge can be overcome with additional support. She carries that philosophy into her medical practice. The physician Debbie (Dr. Stafford) is always expanding her knowledge through the help of others. Seminars, conferences, videos and tutorials given by other doctors is an important part of Dr. Stafford’s expansion of her knowledge and surgical skill. After middle school, Debbie was excepted to a number of top Los Angeles prep schools. She decided upon the Buckley School. While at Buckley, Debbie participated in a number of extracurricular activities while earning multiple academic honors. She contributed to the school literary magazine in addition to being very active in track and field. She was also active in art and painted a number of oil paintings She was voted most athletic by her senior class and earned the second highest GPA in her graduating class and was awarded the privilege of addressing the school at her high school commencement. Because Debbie had known since a young child that she wanted to pursue a doctor of medicine degree, she applied to a number of accelerated medical programs. She was accepted into the Ivy League school Brown University. The Program in Liberal Medical Education (PLME) at Brown University identifies young people at a very early stage who have demonstrated a strong desire for a career in medicine. The students enter medical school at Brown after completing three years of undergraduate studies at Brown. At Brown, Debbie concentrated in Applied Mathematics- Biology. The Applied Math – Biology concentration recognizes that mathematics is essential to address many modern biological problems in the post genomic era. … These mathematical methods apply very broadly in many biological fields including population growth and the spread of disease. Debbie majored in a mathematics based study because she felt that mathematics allowed a person to develop an analytical mind and way of thinking. While an undergraduate at Brown, Debbie continued pursuing her extracurricular activities such as martial arts and piano. She performed in a number of recitals as a solo pianist as well as chamber music and accompanied flautists and violinists in their student recitals. She was also invited to perform for medical school faculty and local businesses. Debbie officially began the medicine portion of the PLME program in 1986. In the third year of medical school, student doctors needed to seriously consider which specialty they would enter after medical school. Debbie had many interests. She was considering psychiatry, anesthesia, obstetrics/ gynecology, emergency room medicine, and general surgery. Debbie did not develop an interest in plastic surgery until she attended a lecture about the specialty given by a staff plastic surgeon to the medical students during her general surgery rotation. Every week, a different surgical subspecialty was presented to the students as a lecture so the various surgical specialties could be introduced. Debbie was amazed at the various types of procedures performed by plastic surgeons. Plastic surgeons perform hand surgery, complex, trunk, extremity and craniofacial reconstruction to cosmetic procedures of the face, body and breast. After the lecture, Debbie introduced herself to the staff plastic surgeon and asked if she could scrub on his cases. The doctor was happy to allow Debbie to observe. She will never forget the first time she observed a breast reduction. She actually was “horrified” at what she saw. She thought to herself, this doctor has taken apart this women’s breast. How is he ever going to put it back together. Because she was a young medical student at the time and had not ever seen a breast reduction, she could not make “head or tails” of the breast anatomy. Of course, in the end, the breast came together beautifully. She also recalls having the same bewildered feeling when she first observed a cleft lip and palate repair as a plastic surgical resident. Whenever Dr. Stafford recalls these early experience as a young medical student and plastic surgical resident, she is reminded of the amazing artistry of plastic surgery. After graduating from medical school with honors and numerous awards (Faculty Scholar and ) being accepted as a member of the scientific honor society, Sigma Xi and leaving Brown, the twenty four year old Dr. Stafford began her internship in surgery at King-Drew Medical center in Los Angeles, CA. During her six years at King-Drew, Dr. Stafford gained a hands on medical and surgical education that a inner city county hospital offers. She was interviewed by the Los Angeles times and was featured in an article called “Trained by Fire”, participated in basic science research which concluded in multiple scientific presentations and served as chief resident in her senior year. Although there were a some discouragements from a handful of practicing plastic surgeons that Dr. Stafford had sought out as mentors, the overall experience leading up to her plastic surgical residency was an amazing one and Dr. Stafford found herself very well prepared when she continued her training at the world renowned Mayo Clinic as a plastic surgery resident. 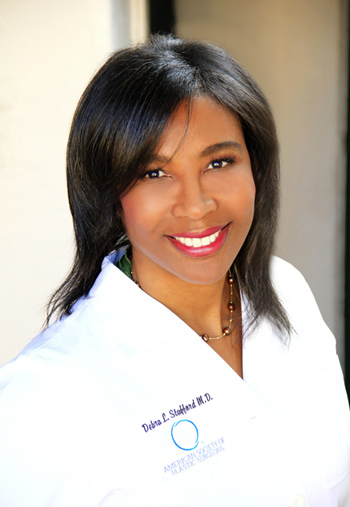 Dr. Vivi Stafford, Debra’s sister, joined the practice in 2004. Contoured Images Plastic Surgery and Up Health Medical is an innovative clinic that not only practices traditional evidence base medicine but also embraces holistic approaches. We offer the latest technology in terms of aesthetic lasers, radiofrequency, light therapy, micro needling. We also, offer a variety of peels, dermal fillers in addition to stem cell treatments and infusion therapy and skin care products. On the surgical side, we embrace modern and innovative surgical techniques, instrumentation and technology to achieve effective and safe results in addition to providing the patient as rapid and comfortable recovery possible. Finally, we pride ourselves in continued relationships with our patients to aid them in maintaining their results with diet and exercise programs, body contouring treatments and facial treatments that will allow the patient to look as good as possible. Drs. Debra and Vivi Stafford in addition to the staff are also very engaged in the patient’s long term results. Drs. Debra and Vivi Stafford are readily accessible and always willing to communicate openly and honestly with the patient to allow for a smooth journey to a better self. Aesthetic medicine can be particularly challenging for the aesthetic /cosmetic physician because aesthetic medicine is elective and patients have spent their entire lives looking at their own bodies and faces in conjunction with societal standards and some will have very specific and detailed visions of how they wish to look. In contrast to non elective medicine, the patient will have a significantly higher degree of input in the treatment plan. For example, most patients would not be able to comment on the latest NIH chemotherapeutic cancer regimen but would possess a degree of “expertise” in the latest cosmetic skin laser. Drs. Debra and Vivi Stafford pride themselves in speaking and consulting with patients honestly and respectfully. The doctors will always listen to patient’s concerns, expectations and wishes and will keep an open mind and will not pre judge any patient. Often, the most important thing any physician can do (especially a plastic surgeon ) for their patients is to listen. The medical practice Contoured Images Plastic Surgery and Up Health Medicine prides itself in being available for all people including the LGBT community, every ethnicity, religion, racial make up, age and economic circumstances. The practice was purposefully established as a “storefront” directly on the street as opposed to being enclosed in a high rise because Dr. Debbie and Dr. Vivi wanted to be accessible to people. Walk in patients are welcome and we do our best to accommodate them immediately or arrange an appointment if we are unable to do so. We also pride ourselves in working with any budget. We have photo documentation of patients who look more refreshed after fifty dollars of Botox. In addition, Drs. Stafford will support their recommendations with extensive scientific data, photo documentation, previous experience and artistic standards. However, the practice and a patient occasionally come to a crossroad in deciding upon the correct treatment course and mutual agreement cannot be obtained. In this rare instance, the patient is encouraged to seek alternative opinions with other doctors. Drs. Debra and Vivi Stafford possess a strong aesthetic eye and are very visual and possess excellent critical thinking. In fact, their philosophy and belief is that critical thinking is the most important gift that a surgeon should possess. She and Dr. Vivi are constantly reevaluating their techniques in every procedure that they perform. Dr. Debra is constantly searching for “surgical pearls” that will enhance her patient’s results and has obtained her degree of success in plastic surgery with years of study, practice and constant reevaluation of results and techniques.